Financial markets throughout the world are effectively tightly woven together as a result of the free cross border movement of capital. Likewise the global economy is closely integrated because of the increasing trend towards free trade. These are indeed dangerous times for political leaders. Any upheaval in a major financial centre or economy can spread like wildfire to other centres or economies. Since political stability of a country very much depends on the state of its economy, each country must start building its own firewall. This means restricting the free flow of capital and goods. Hoarding US dollars as foreign reserves is not enough. It's not that the free movement of capital and goods are bad; it's just that there are times when they are appropriate as well as times when they should be abandoned. It all depends on the stage of the investment and economic cycle we are at. Savvy financial investors are aware of the investment clock which identifies the type of investments appropriate at any moment in the economic cycle. The usual clock depicts business slowdowns as occurring between 3 o'clock and 6 o'clock. However, I prefer the one used by Baring Securities, itself long subsumed by another entity. 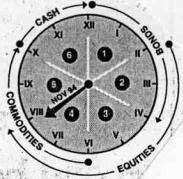 Its investment clock shown here, appeared in The Economist, Nov 1994. Instead of 3 o'clock, the slowdown in Baring's clock begins in the final sector, numbered 6, i.e., from 10 o'clock to 12 o'clock. The clock can help us reestablish our bearing, more so in current conditions where the signs are pointing towards a depression yet policymakers still insisting on growth being in the offing. The clock starts at noon, where the mood is still bearish as the economy exits the previous downturn. The preferred investment at this stage is bonds because interest rate at the end of a recession is high but is trending lower with increasing liquidity. This makes for a rising bond price. A $1,000 bond with 10% coupon that matures in 5 years' time can rise in price to $1,216 if the prevailing interest rate falls to 5% from 10%. By 4 o'clock, bonds have lost their lustre as not much capital gain can be had by holding on to them. The interest rate will stop falling. As the economy expands, more money enters circulation. Inflation is still low and holding steady since the economy still has spare capacity. Equities go up in prices in tandem with increasing profits from greater sales. Occasionally, the money supply races ahead of economic output and inflation follows but this is easily put right by slamming the brakes on the money supply. However generally the inflation is subdued. These two factors - rising profits and stable monetary value - are what make equities attractive. The good times for equities are between 2 o'clock and 8 o'clock but an orderly retreat should be made from 6 o'clock forward. As the economy keeps expanding, it will hit constraints in certain sectors, such as commodities and real estate because the supply of these goods takes time to keep up with the increasing demand. The money supply meanwhile keeps on increasing as the production of other economic goods has to be sustained with many more producers entering the fray. But these producers' margins are razor thin because on the cost side, they have to pay more for the commodities while on the revenue side, they have no pricing power with most markets being over supplied with competing products. The commodity supplies bottleneck are only a temporary setback. Their high prices are a reflection of the surplus money flooding the market. As new mines and fields are discovered and opened, the prices will come down to earth. If not for the surplus liquidity, the economy would have fallen into recession much earlier. The liquidity has deferred the collapse but at the risk of magnifying and prolonging the eventual debacle. The commodities ascendancy starts at 6 o'clock and ends at 10 o'clock. Right now, it has expired. We are now in cash territory. The investments in equities, real properties and commodities turn sour as their returns become out of sync with their inflated prices. Income from these investments can no longer support the loans used to finance their purchases. Increasing loan write-offs start spooking the banks. Banks stop lending and begin hoarding cash. Every time a loan is written-off, the money supply shrivels. Loans on the debit side of a bank's balance sheet are matched by deposits on the credit side. But loan write-offs are magnified by the bank's leverage. One dollar of loan write-off hits the bank's capital by that amount but because of the capital asset ratio, the bank has to reduce its loan portfolio by 10 dollars. The impact on the money supply is therefore 10 times. From 10 o'clock to 12 o'clock, the increasing debt defaults push up the real interest rates in order to account for the high risk. Still, the banks will not lend at any price. Citibank's cash and deposits balance as at 30 September 2009 stood at US$244.4 billion, the largest in its history. Even though the Fed and other central banks are fixing their lending rates at record low levels, the banks refuse to disburse new loans. Only investment banks, such as Goldman Sachs and JP Morgan can still chalk up huge profits as a result not of lending but of trading in stocks, bonds and foreign currencies. The shrivelling money supply triggers declining general prices. Nominal interest rates may be low but the falling prices make the real rates high. The likelihood of businesses going bust grows. Falling prices and failing businesses feed on each other in a vicious circle. The Fed's quantitative easing or money printing won't solve the problem as it's not increasing the total money supply. It's just converting an illiquid money (bonds and other debts) into a more liquid one (cash and deposits). This has resulted in the liquid money being used not for lending but for trading in stocks and commodities. So we are now having a short-lived aberrant hike in stock and commodity prices. To make up for the vanishing money, it's up to Obama to rack up humongous deficits year after year without fail. His recent US$787 billion stimulus has provided a limited GDP growth in the third quarter. But the stimulus will taper off in 2010 and 2011. To sustain this growth, the US needs no less than US$1 trillion budget deficit each year. That unfortunately appears more difficult with each approaching year as the House and Senate look set to admit more Republican congressmen in the midterm elections next year. The gloomy mood will not only pervade sector 6 of the chart but will continue to sectors 1 and 2. Only in sectors 3, 4 and 5 will the social mood be cheerful again. For the political leaders and policymakers who have been proclaiming that recovery is just around the corner, don't bet on it. They suffer from extreme bouts of amnesia and even if they don't, they won't be around long enough to answer for their careless remarks.